GIS Tutorial 2: Spatial Analysis Workbook includes step-by-step exercises that teach readers important analysis skills. Redlands, California—GIS Tutorial 2: Spatial Analysis Workbook, published by Esri, will help experienced geographic information system (GIS) software users hone their spatial analysis skills using Esri's ArcGIS technology. The fourth edition of this workbook, updated for ArcGIS 10.3 for Desktop or later versions of the software, includes step-by-step exercises that teach readers important analysis skills. Early exercises teach how to map and analyze location data to determine quantities (e.g., rainfall amounts) and densities (e.g., population density per census block or crime density per square mile). Other exercises focus on how to analyze relationships among datasets, find what's nearby, map change in location and magnitude, map percentage change in values, measure geographic distribution, analyze patterns, identify clusters, and do hot spot analysis. Author David W. Allen emphasizes the importance of using spatial analysis to bring the "big picture" into view. "Spatial analysis involves the problem-solving aspect of GIS," says Allen, the GIS manager for the City of Euless, Texas, and a GIS instructor at Tarrant County College. "The tools are basic—buffers, overlays, selections—but when combined in a particular sequence, they can reveal things about the data that cannot be seen in a spreadsheet or a chart." 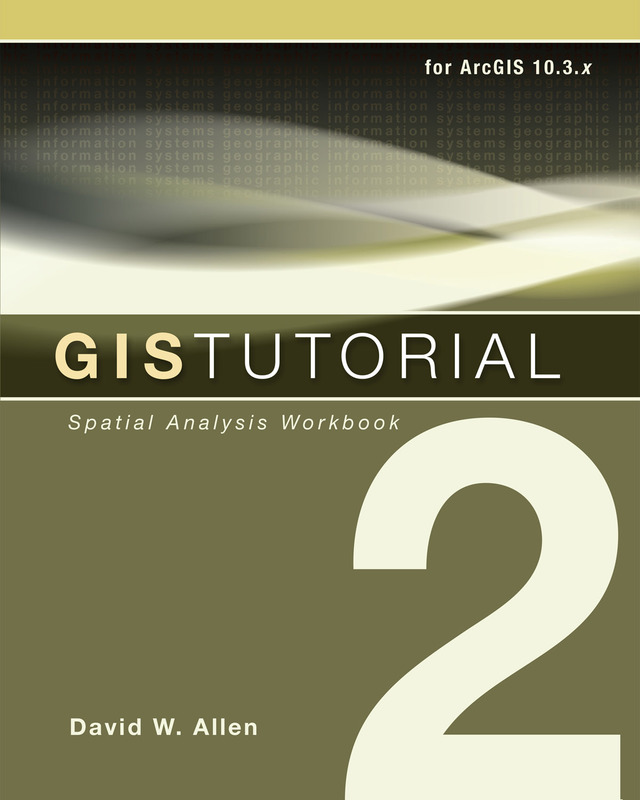 GIS Tutorial 2: Spatial Analysis Workbook is a companion to the two-volume Esri Guide to GIS Analysis, written by Andy Mitchell. Allen recommends reading volume one of the guide before working on chapters one through six of the workbook and reading volume two before completing chapters seven through nine of the workbook. GIS Tutorial 2 includes access to exercise data, a 180-day trial of ArcGIS 10.3.1 for Desktop, and resources for instructors. Besides writing GIS Tutorial 2, Allen is the author of Getting to Know ArcGIS ModelBuilder and the coauthor of GIS Tutorial 3: Advanced Workbook. GIS Tutorial 2: Spatial Analysis Workbook is available in print (ISBN: 9781589484535, 344 pages, $79.99) or as an e-book (ISBN: 9781589484597, 344 pages, $39.99). The book can be purchased at online retailers worldwide, at esri.com/esripress, or by calling 1-800-447-9778. Outside the United States, visit esri.com/esripressorders for complete ordering options, or visit esri.com/distributors to contact your local Esri distributor. Interested retailers can contact Esri Press book distributor Ingram Publisher Services.